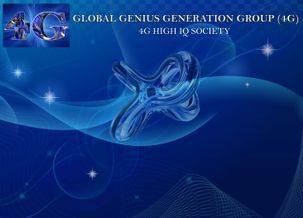 Global Genius Generation Group (4G) is a four standard deviations high IQ society founded in 2013 by Iakovos Koukas. Purpose of 4G High IQ Society is to introduce new and innovative ideas by bringing together creative genius individuals who have an Intelligence Quotient in the top 0.003% of the general unselected adult population (IQ 160 sd15). An IQ of 160 sd15 is an intelligence performance expected only by 1 in 31,500 individuals and it is generally perceived as a genius IQ. 4 stands for the sd above the statistical mean of the general unselected adult population and G represents the g factor of psychometrics.